Note: Castlevania Puzzle: Encore of the Night is now available in the U.S. [Link] as well as Internationally [Link]. We’ve bumped up this review to reflect the new U.S. release. Back in May when Konami announced a new Castlevania game exclusive to the iPhone, many gamers (myself included) were disappointed to find that it was actually a gem matching game with a Castlevania theme. With Castlevania Puzzle: Encore of the Night being released today, to say that I was skeptical that I would enjoy it would be a huge understatement. Much to my surprise, not only did I enjoy the title a great deal, but I became helplessly hooked on leveling up my character, discovering new items and spells, and exploring the immense castle in the game. 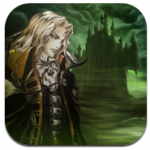 If you can get past the fact that this isn’t your traditional Castlevania affair, then you will be treated to one of the best puzzle-RPG games available for iPhone. 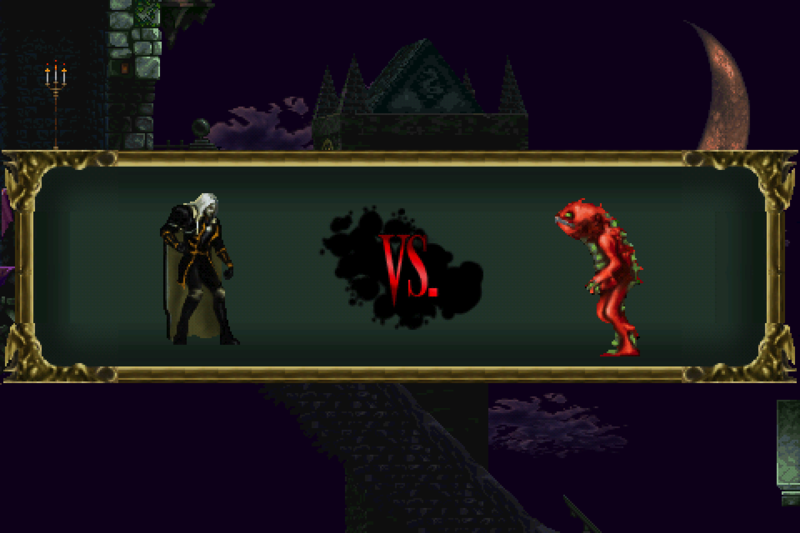 Castlevania Puzzle is an offshoot of the highly regarded Castlevania: Symphony of the Night game that began life on the Playstation but has since been ported to multiple platforms. Most of the characters, backgrounds, and even the actual layout of the castle will be familiar to fans of SOTN. The music is also of the same excellent quality as the original title, and actually much of it sounds like just slight remixes of the first game’s music. 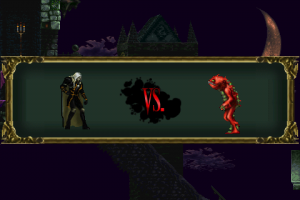 Characters are comprised of sprites that look only slightly upgraded from those in SOTN, which means they’re a bit pixely, but they are animated nicely and fit the overall theme of the game. Everything about Castlevania Puzzle looks, sounds, and feels like the Castlevania we all know and love. >Like most the Castlevania games in recent years, you’ll make your way through Dracula’s castle room by room, with certain parts of the castle being unreachable until obtaining the proper item or ability. This means that revisiting parts of the castle is a must as you attempt to explore every nook and cranny. 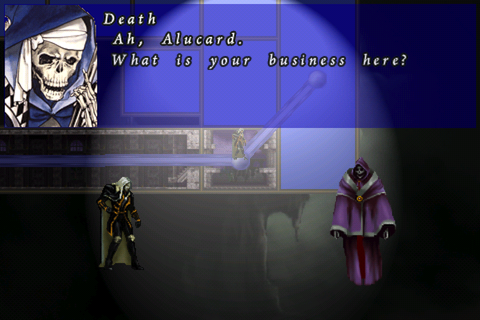 This is made less tedious by the inclusion of teleportation rooms spread throughout. A set of lines connecting each of the rooms together tip you off to which way you can proceed, and once you enter a room you may find an item, battle against an enemy, or sometimes nothing happens at all. When you do enter into a battle, a short intro animation (which can be skipped by tapping the screen) shows you what enemy you’ll be facing. You then proceed to the arena which looks similar to competitive gem matching games of this type. Gems fall in pairs of two from the top of the screen, and matching 3 or more of the same color gem erases them from the board, sending blocks to the opponents side and dealing damage to their HP. Gem pairs can be moved by sliding anywhere on the screen, rotated with a quick tap, and sent directly down with a swipe. Some gems are inactive, meaning they won’t disappear when matched with like colors until a match has been made to gems that are touching their perimeter. They then turn into normal gems, and through strategic planning this facet can be used to create elaborate chains and score huge hits on the enemy. Gameplay is nothing groundbreaking for a game like this, but it works and is an easy concept to pick up on. Filling the opponents screen to the top with gems doesn’t necessarily mean they’re defeated, and will instead take a chunk of their HP away. This means that for enemies with a large amount of HP, you may actually fill their screen to the top multiple times before finally defeating them. This works the same for you, and winning a match comes down to who can completely deplete the other players HP first. The battles in Castlevania Puzzle are slightly mundane at the core, but the addition of items and magic spells to the formula spices things up quite a bit. As you traverse the expansive castle, you’ll come across various items that can be used during battle. A quick access menu at the bottom of the battle screen gives you four slots to assign either an item or magical spell to. Each time your character levels up you can assign points to typical attributes like strength and stamina, as well as magical areas. There’s five types of magical areas to level up in (like Lightning and Fire for example) and each one of those contains four unique spells to learn. Leveling up your character is great fun as you can choose to hone in on specific areas like strength or a particular magic type, or just slowly enhance them all in a balanced fashion. Using one of these spells from the quick menu will instantly deduct an amount of HP from the opponent you are fighting. In addition to the magic system, there’s a number of weapons and armor to collect and equip your character with. These can affect your overall offensive and defensive stats, and as you take on progressively harder enemies and bosses, it’s vital to be outfitted with the strongest gear possible. There’s even a shop that can be visited from the teleportation rooms in the castle. You can buy or sell items and equipment with the money you earn from defeating enemies. 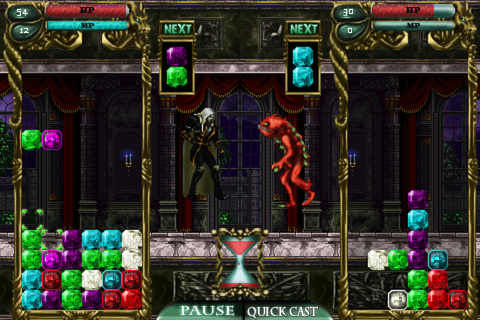 Castlevania Puzzle is an incredibly complex game, and while on the surface it appears as merely a gem matching game with a Castlevania theme, there’s much more going on here than just that. As such, there’s certainly aspects that I haven’t touched on in this review, but this should be ok as the game has a fantastic tutorial system. The same character that runs the shop also serves as the guide, and he’ll pop up from the bottom of the screen whenever you embark on something new. It’s really well explained, and although it’s a complicated game, the tutorial makes sure you can ease into everything as you become familiar with it. Once you do, the game flows really well and is completely engaging as you want to explore just a bit more of the castle or earn some XP on your way to your character’s next level. I’m not going to deny that I wish a proper Castlevania game would come to the iPhone in all its platforming and enemy whipping glory, and I’m still holding out hope for that someday. 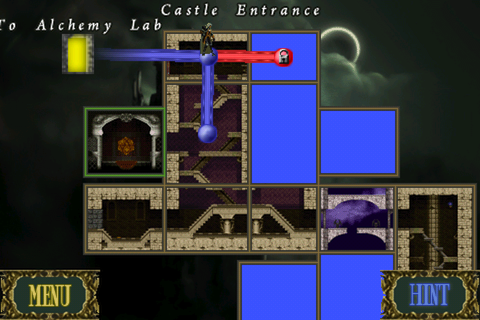 But it’s hard to dismiss what a fantastic game Castlevania Puzzle actually is, and most importantly how much fun it is. My only real complaint about the game is that the controls during battle can be overly sensitive. Not unplayably so by any means, but expect to errantly spin a gem or accidentally send one to the bottom when you don’t mean to. You adjust to it somewhat to, so it’s surely not a deal breaker. With countless items and weapons to collect, a number of spells to learn, plenty of enemies and gigantic bosses to fight, and a compelling story and character progression system to tie it all together and keep you playing, Castlevania Puzzle: Encore of the Night will keep you busy for a long time. Most importantly, however, is that despite the gem battling aspect of the game it feels entirely like a robust Castlevania game through and through, and should really appeal to fans of the series.